The last thing teams want to see: A guy they had (DeSean Jackson) beating them while wearing another team's uniform. When the Eagles and the other 31 NFL teams kick off this year’s draft on April 25, they’ll be looking for more than just good players. They want players who suit their systems and culture, good long-term fits. Pro Football Reference did a 20-year study a few years back that showed 16.7 percent of drafted players never played a regular-season game for the team that drafted them, and 37 percent rarely saw the field. So, that’s well over half of draftees who ended up contributing virtually nothing, after all the film work and research that went into drafting them. With odds like that working against you, what you really don’t want, two or three or four years down the road, is for some other team to beat you with the guy you drafted. In a way, that’s worse than whiffing on a pick; you recognized the talent but failed to maximize it. A version of this dynamic played out just recently, when the Eagles brought back DeSean Jackson after a five-year absence. Jackson and Eagles coach Doug Pederson told of an encounter during the Birds’ Week 2 loss at Tampa Bay last season. 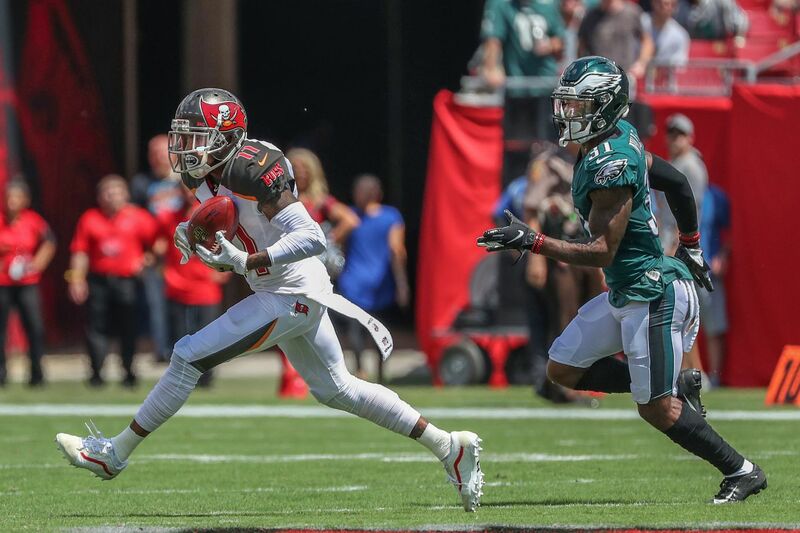 Jackson scored on the first play from scrimmage, a 75-yard pass play that keyed the Bucs’ 27-21 victory. Later, there was an injury break and Pederson was close enough to Jackson to interact. “I’m like, ‘It’s not you, man,’ ” Jackson said. The Eagles drafted Jackson in the second round, 49th overall, in 2008. Cut by Chip Kelly in 2014 after the best season of his career, Jackson went on to go 5-1 against the Eagles as a Redskin and a Buc. During the Andy Reid years, this sort of thing almost never happened to the Eagles. They didn’t always draft well – a few times they drafted horribly -- but they made the right decisions on who to let go and who to keep. Brian Finneran saw success with the Falcons after being cut by the Eagles. Reid cut undrafted Villanova wide receiver Brian Finneran after he played in just three games in Reid’s inaugural 1999 season. Finneran went on to spend nine years with the Falcons and finished with 238 receptions for 3,093 yards. Raheem Brock was the 238th player chosen, late in the seventh round, in 2002. He was an undersized defensive end from Dobbins Tech and Temple who ended up being cut before training camp, because the Eagles spent most of their rookie cap money elsewhere and wanted Brock’s agent to take less than even the meager signing bonus allotment slotted for 238th overall. Brock and his agent had faith in his talent and it paid off; he would play 152 NFL games, most of them with the Colts, and win a Super Bowl XLI ring. Most often, a draftee who goes on to have success elsewhere leaves the team that drafted him when he becomes a free agent, or because of a regime change that makes him a poorer fit – sometimes the regime change leads to letting a player leave in free agency. This was a factor in the stability of the Reid years; 14 seasons of running the same offense and defense, looking for the same types of players. Then, of course, Reid was fired, and in 2013 Kelly came in, with very different concepts. In some cases, players projected to be bad fits – such as defensive ends Brandon Graham and Vinny Curry – actually played well in new roles, adjusting to the 3-4 defense that Kelly mandated. But Kelly proved to be a poor judge of talent and fit. Everybody knows about Jackson and LeSean McCoy, two all-time Eagles Kelly banished in their primes. But other personnel gaffes also subtracted useful players. Kelly drafted Jordan Poyer in the seventh round in 2013, 218th overall, then cut him that October. Poyer was picked up by the Browns, switched from corner to safety, and began to flourish. He signed a four-year, $13 million free-agent contract with the Bills two years ago, and since has started 31 of a possible 32 games for them, intercepting nine passes. Could the Eagles have used another good safety? Dion Lewis, a 2011 fifth-round draft pick, was tossed aside by Chip Kelly in 2013. Fans were upset when the Doug Pederson/Jim Schwartz regime traded Kelly’s 2015 second-round corner, Eric Rowe, to New England in 2016, but they got over it in much the same way that Alshon Jeffery got over Rowe in Super Bowl LII. But running back Dion Lewis, drafted in 2011’s fifth round by Reid and Howie Roseman, carelessly discarded by Kelly in 2013, was the Patriots’ top postseason rusher that year. Lewis then signed a four-year, $20 million free-agent contract with Tennessee. Other than Jackson and McCoy, the most egregious Kelly-era miss on talent evaluation might have been with an undrafted player, Alejandro Villanueva, in 2014. Villanueva is a unique story; a Bronze Star-winning Army Ranger captain who played wide receiver his senior year at West Point, trying to find a place in the NFL after five years away from football. The Eagles had vision enough to sign Villanueva out of a tryout camp, but not enough to know what to do with him. They saw Villanueva, 6-foot-9 and at the time 250 pounds, as a defensive tackle, and quite a long-term project. Kelly was never renowned for his patience. He cut Villanueva, but not before Pittsburgh coach Mike Tomlin took notice in a preseason game. The Steelers made Villanueva an offensive tackle. He now is listed at 340 pounds, and he has started at left tackle for them since 2015. Since Roseman was reinstated in 2016, the Eagles have drafted 21 players. Seventeen are on the current roster (though Donnel Pumphrey was cut, joined the Lions, and came back). The only player from that group who has done anything for another team is safety Blake Countess, a sixth-round pick in 2016 who was cut before that season and was picked up by the Rams; Countess has appeared in all 32 Rams games the past two seasons, excelling on special teams. He picked up a blocked punt and scored with it in the Eagles’ 43-35 victory against Los Angeles in 2017. That game is much better remembered for Carson Wentz’s season-ending knee injury. If you look back a bit farther, though, Roseman’s lack of enthusiasm for Kelly’s picks is obvious. The Eagles also drafted 21 players from 2013-15. Only Lane Johnson (first round, fourth overall in 2013), Zach Ertz (second round, 35th overall in 2013) and Nelson Agholor (first round, 20th overall in 2015) are still Eagles today. It remains to be seen if anyone like 2015 third-round linebacker Jordan Hicks, now with Arizona, or 2014 seventh-round defensive tackle Beau Allen, now with Tampa Bay, can prove the Eagles made the wrong move in parting with them. Get insights on the Eagles delivered straight to your inbox with Early Birds, beat writer Zach Berman’s newsletter for Eagles fans. Click here to sign up.